Depending on the ViewType, RadListView provides a convenient way for customizing the items. Items appearance in RadListView can be customized by making use of the VisualItemFormatting event. The following example, demonstrates how you can change the color of an item which is being selected. By using this event to customize the items appearance, you should always provide an else clause, where you reset the appearance settings which you have introduced. This is necessary since RadListView uses data virtualization, which might lead to unpredicted appearance results when items are being reused. The DetailsView of RadListView provides a grid-like interface for displaying items with more than one data field. It is possible to customize each cell element, using the CellFormatting event. Cell elements are created only for currently visible cells and they are being reused, when scrolling. In order to prevent applying the formatting to other cell elements, all applied styles should be reset for the rest of the cell elements. 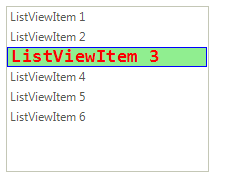 In order to customize the header cells they should be cast to the DetailListViewHeaderCellElement type.